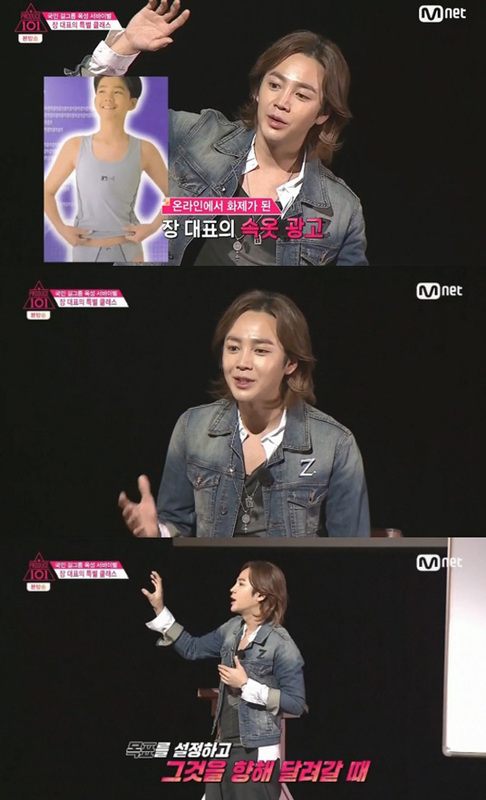 Actor Jang Keun Suk who serves as the messenger and mentor of Mnet ‘Produce 101’ gave an advice from the heart to the trainees whose aim is to debut as a singer. During the ‘Produce 101’ broadcast on Feb 19 evening, we can see the special lecture delivered by Jang Keun Suk for the trainees. Jang Keun Suk asked first “Why do you want to be a singer?” and “When I was a child, we lost our house so I started working to earn money”, as he revealed his past. And “I was teased by everybody because of that underwear advertisement from which I earned 2 million KRW. The 2 million KRW could pay the rent for my family’s house. Since that time, I have lived my life proudly”. Suk told further about his life as an entertainer since the early age. “Please set a goal, a driving force and run towards it. Please do not fight against each other, look at the mirror and fight against yourself. I want myself to excel. If you think like that, you can get back being focused. " he advised. The trainees were listening seriously to Jang Keun Suk’s experience and this motivated them to make a solid resolution once again. PRODUCE 101’ is an ultra large scale survival project with 101 female trainees participating from approximately 50 entertainment companies in South Korea, in order to debut as a girl group unit based on the public votes. 11 contestants will be finally selected based on the voting on the official website 100% by the audience (http://mnettv.interest.me/produce101/main.dbp) and the audience can participate in the decision for the concept, the debut song and the group name. It's broadcasted every week by Mnet channel at 11:00 pm on Friday.